.The Elecfreaks Joystick Shield features Nokia 5110 LCD and nRF24L01 interfaces. 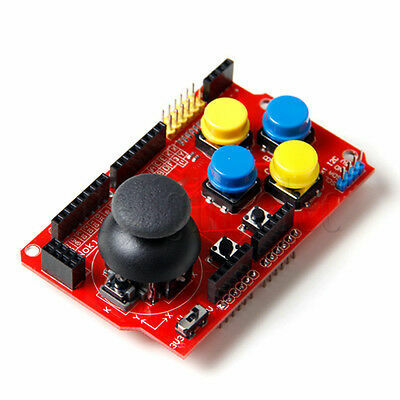 You can easy develop your Joystick games, and even communicate with others over the air with the nRF24L01. The shield sits on top of your Arduino and turns it into a simple controller. 7 momentary push buttons (4 big buttons + 2 small buttons + joystick select button) and a two-axis thumb joystick give your Arduino functionality on the level of old Nintendo controllers. Note: If you are using the Joystick Shield with the Nokia 5110 Display you can't use a standard Arduino board as those only supply 50mA on the 3.3V pin which is not enough for what the Nokia 5110 backlight needs. Make sure you use a board that can handle more than 50mA on the 3.3V pin if you are using the Nokia 5110 and want backlight! You can also connect it to other platform by 2.54 mm header. you should see different values printed on a line and refreshed very quickly. these are the state of the various buttons present on the joystick shield, as well as the current position (x and y value) of the joystick. Please feel free to leave any comments or questions you may have about this module.